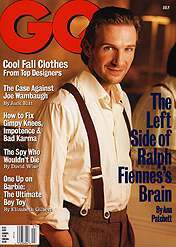 July 1998 - RALPH is GQ Magazine's cover story!! 7/14/98 NEW YORK (Variety) - Ralph Fiennes is negotiating to star in ``The End of the Affair,'' a film based on a Graham Greene novel that has the romance of ``The English Patient'' with a bit more steaminess. Variety says the story, which takes place during the London Blitz, revolves around a man and woman enduring a cold marriage until the wife falls for one of her husband's dear friends, a writer played by Fiennes. The writer and the woman have a very steamy albeit brief affair, which she ends abruptly. The lover later discovers that the woman has made a pact with God that if the Almighty spares her lover from a particularly bad bombing raid, she would agree never to see him again. BUDAPEST (AP) -- Ralph Fiennes is using goose liver and Hungarian love songs to get himself in the mood for The Taste of Sunshine. The British actor will play all three leads in the movie about a Jewish family's struggle to maintain its identity over three generations. He will play a pragmatic lawyer, his Olympic-athlete son and his political grandson. "It was one of the best scripts I have ever read in my life," Fiennes said Monday. Acclaimed Hungarian director Istvan Szabo is directing and also wrote the script. The movie is due out in the spring. Fiennes is limbering up by listening to local love songs, eating goose liver and other Hungarian specialties and taking walks around Budapest.